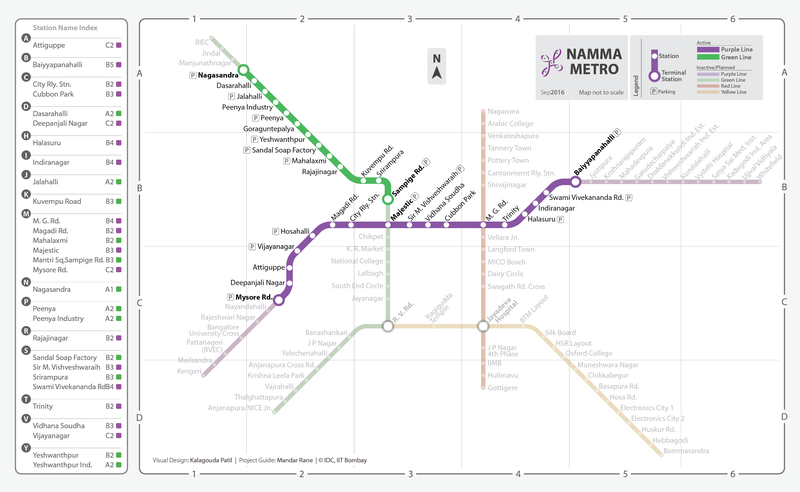 A conversation with Kalagouda Patil (visual designer of NMM) articulating the design decisions behind the design of the Namma Metro Print Map. In discussion is the use of grids, colours and principles of accessibility in visual design. MR: Why did you choose to design NMM? 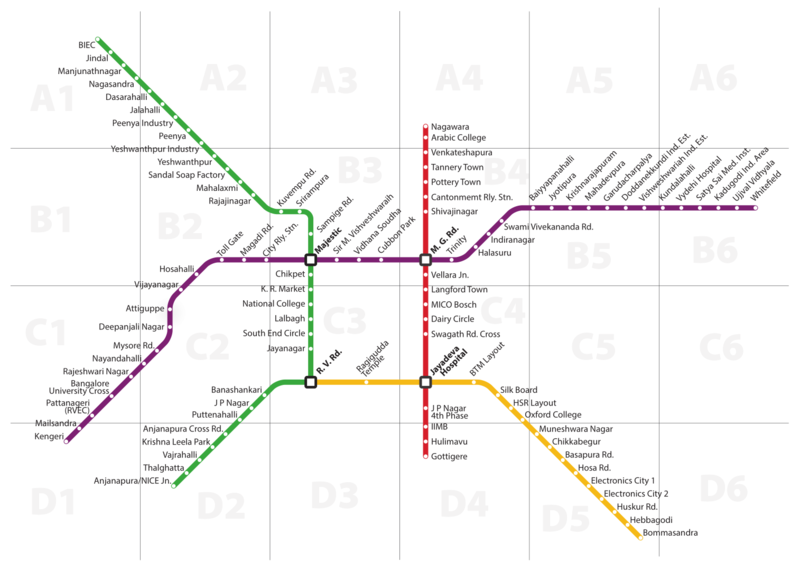 KP: I started designing Namma Metro map as a mini project at IDC. 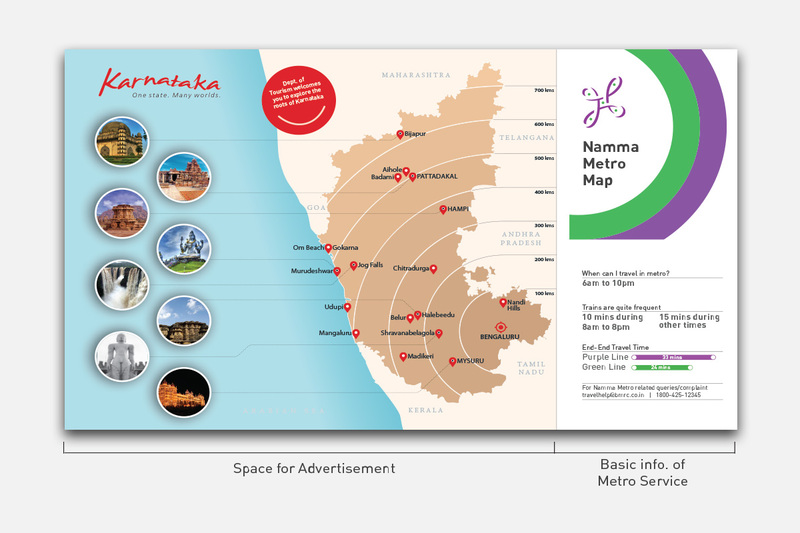 The initial brief was to develop a portable, printed map for Namma Metro-which could be folded up and carried in one's pocket. Information related to Namma Metro is available via smart-phone apps, websites and on-site at the Metro stations- however I wanted to create a portable print map which can be used for a quick and clear overview of all the Metro lines- at the lowest common technology denominator (printed map- doesn't need smart-phone or internet access, though I agree that it has its limitations of being non-interactive etc). Considering the available time i.e., 15 days, I assumed I would comfortably complete this academic exercise. But it didn’t finish in planned time as I thought. It took 25+ iterations over a period of 3 months and it's still developing based on the changes occurring in the growing network. Later, the print version (portable) of NMM, was modified for Web as well. Currently, NMM is available in two languages- English and Kannada, in print and web versions respectively. MR: Can you talk about challenges or major insights? KP: Grids Initially, I was confused about which grid system to adopt- numeric or alpha-numeric? 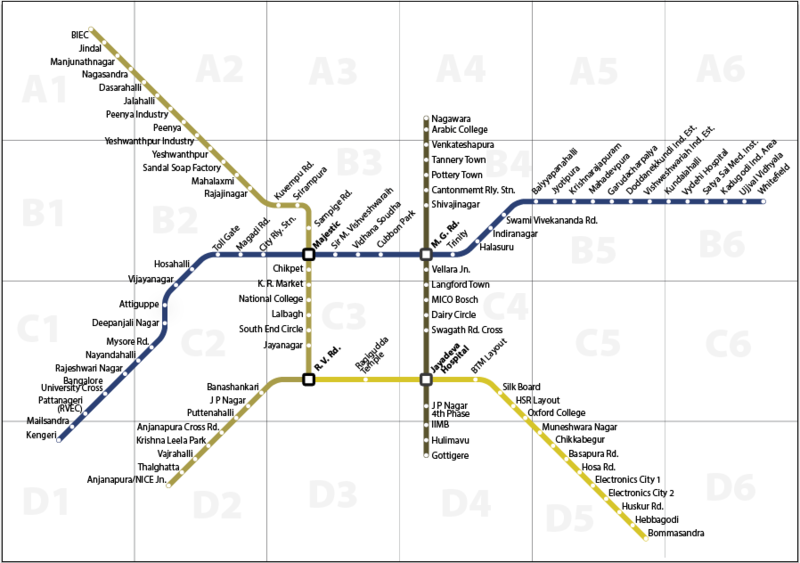 Transit maps often use alpha-numeric grids. The Mumbai Rail Map (MRM) developed by my senior Jaiki uses numeric system as a tool for Index-grid search. Jaiki’s insights and findings had a large influence on my map-design process. At the same time, I was thinking about what universal language could a map adopt. I went ahead with the alpha-numeric grid, as this is an universally accepted system. This helps commuters from abroad to understand the network based on their past knowledge, by removing the need to learn a new system which increases their cognitive load along with anxiousness in navigating in a new place. As far as the local commuters are concerned- based on their literacy levels and exposure to reading schematic maps and grids in general- the learning curve of understanding and using this map varies. The colours were pre-decided by the authority. Green and purple are the colours chosen by managing authority for Phase 1. Phase 2 is planned and will be developed in coming years. Red and Yellow are the colours chosen for upcoming Phase 2. Colours are used in transit systems for differentiation and easy identification of routes. When designing such universal systems, the colours chosen should be colour-blind friendly. This holds good until phase 1. But not along with phase 2, when red and green colour come together they are not perceived to be differentiated by individuals with colour blindness. The same has been communicated to BMRC authorities. 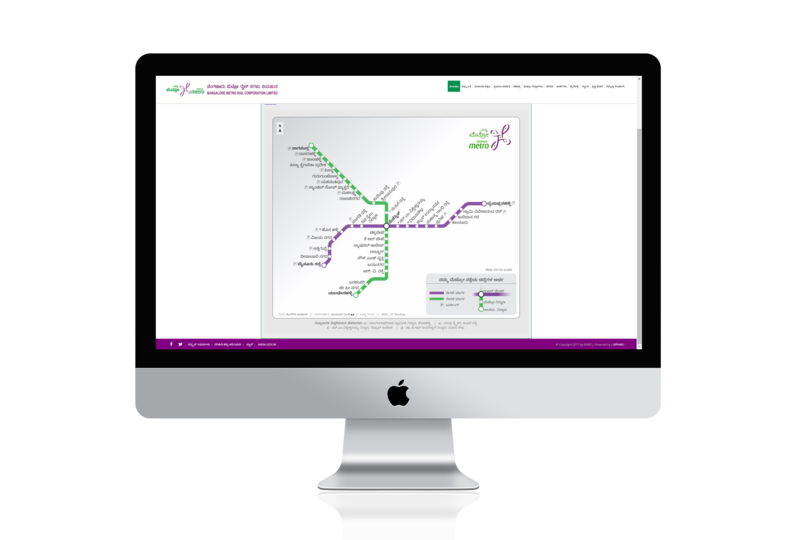 MR: Your map is live on BMRC website. How did this happen? 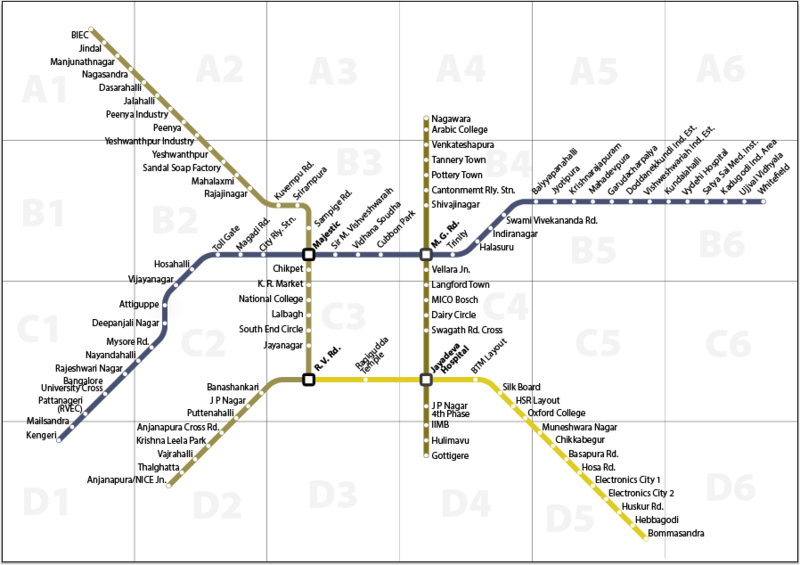 KP: Once the NMM was designed, I mailed it to all the members of managing body along with the print copy of the map, suggesting that they consider this new design of map for the use of Namma Metro. We received feedback- twice, followed by a phone call asking for a map to be put on the website for download. Along with this we proposed a web-friendly map too, that’s when the web map was designed with few modifications . Currently both English and Kannada versions are live. Currently both English and Kannada versions of modified, web-friendly NMM are live on the BMRCL website. MR: What is the future of NMM? KP: BMRC authorities have generously included the web versions in English and Kannada language on their website. If not supported officially, the NMM can serve the purpose unofficially! The print map was designed so that commuters can fold and carry it in their pockets. The space on the back page of the map allows for advertising and promotions-business people can take advantage of this opportunity to publicise their businesses. The map is planned and designed keeping this in mind, so that printing and distribution can be sustained from the advertising revenues. The NMM is but a humble attempt from my side, in form of a student project that is a drop in the ocean of problem-solving in the public transit information domain. Someday, I hope to contribute in form of design of a bus-route map- which covers a larger area, many more routes and is a more complex problem to solve. This space can be used for sponsorship.